A non-malware attack is one in which an attacker uses existing software, allowed applications and authorized protocols to carry out malicious activities. Non-malware attacks are capable of gaining control of computers without downloading any malicious files, hence the name. 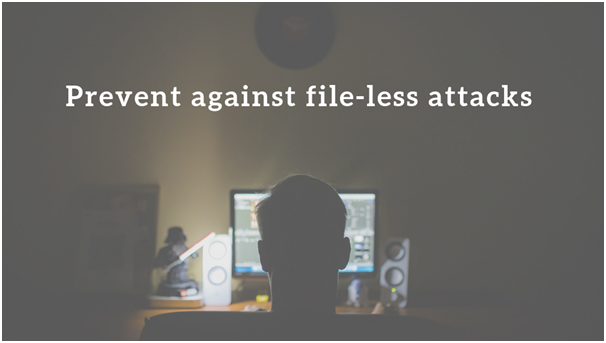 Non-malware attacks are also referred to as fileless, memory-based or “living-off-the-land” attacks. There are always some ways to get footprints of the attack however, the nature of this type of attacks make it very difficult to track them manually. A noteworthy worry for cybersecurity specialists is the fileless assaults, which are difficult to identify. These assaults don’t introduce a malevolent programming to invade a victim’s PC, which makes it troublesome for AV to identify or distinguish them. As per Ponemon Institute, 35% of all cyberattacks in 2018 were fileless, while security arrangement supplier Carbon Black cases that fileless assaults represented half of every single effective datum breaks focusing on financial organizations. Fileless assaults target Windows apps, for example, PowerShell (a scripting dialect which can give programmers unlimited access to Windows API) and Windows Management Instrumentation (utilized by administrators). By locking on to these instruments, programmers gain power over the PC and in the end the organization’s database. They have no signature to detect: Since the processes being run are part of the OS, there is no unique malware executable to use to identify the malware. This makes file-based detection methods completely ineffective. They use reputable tools: PowerShell and WMI are used by IT to perform legitimate tasks (which is not inspected by most EPP solutions). These white-listed apps typically have full control to replicate and remove fileless components and move to legitimate access, so using these tools makes it difficult for endpoint protection solutions monitoring processes to spot malicious use. They keep malicious code primarily in memory: Because there are no clearly malicious artifacts on the file system, detection-based AV approaches become ineffective at determining whether the program is malicious in intent. Invest in MDR administrations that perform danger chasing to search for malignant application conduct in your condition proactively. Latest DNS Spoofing attacks use fragmented datagrams. Can you avoid it?